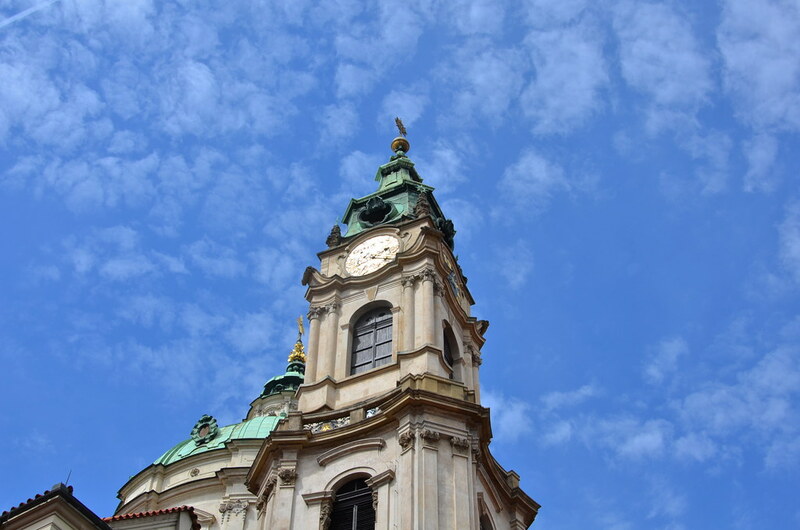 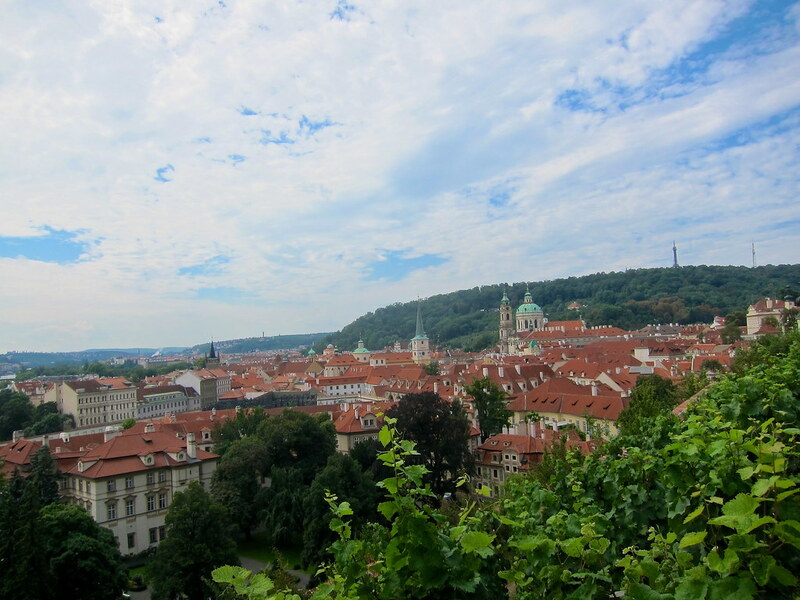 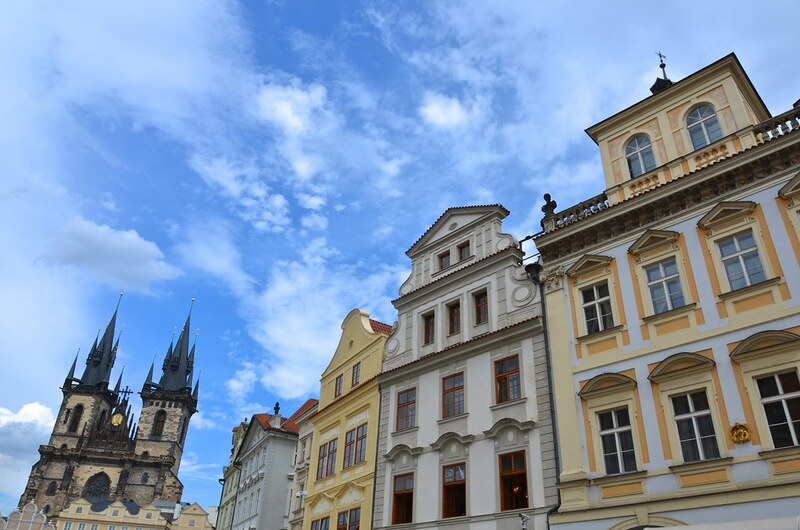 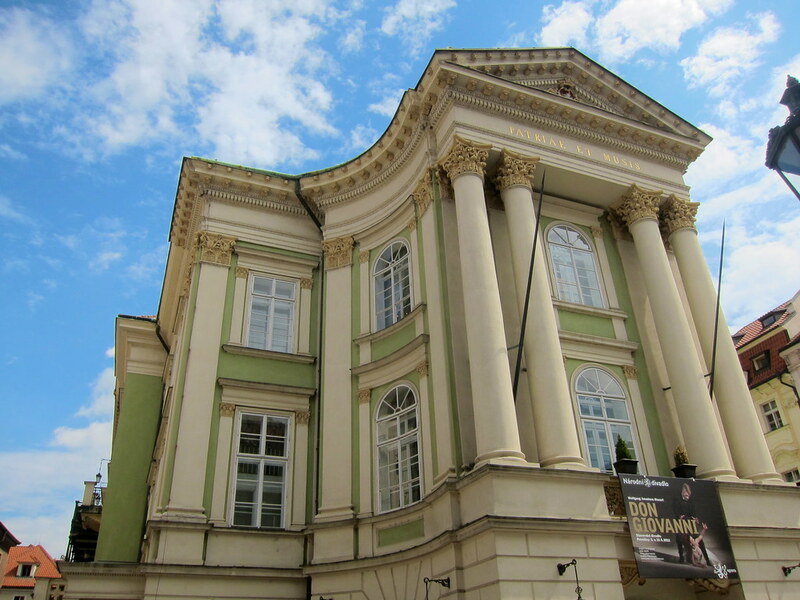 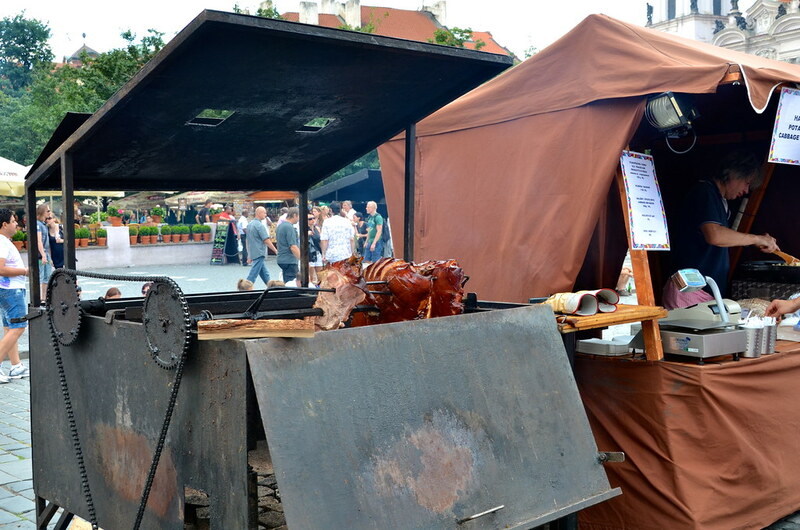 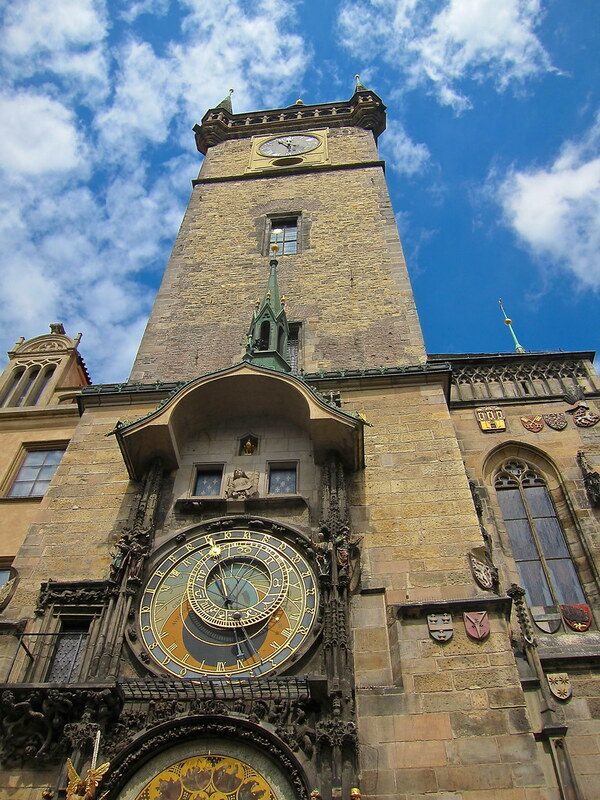 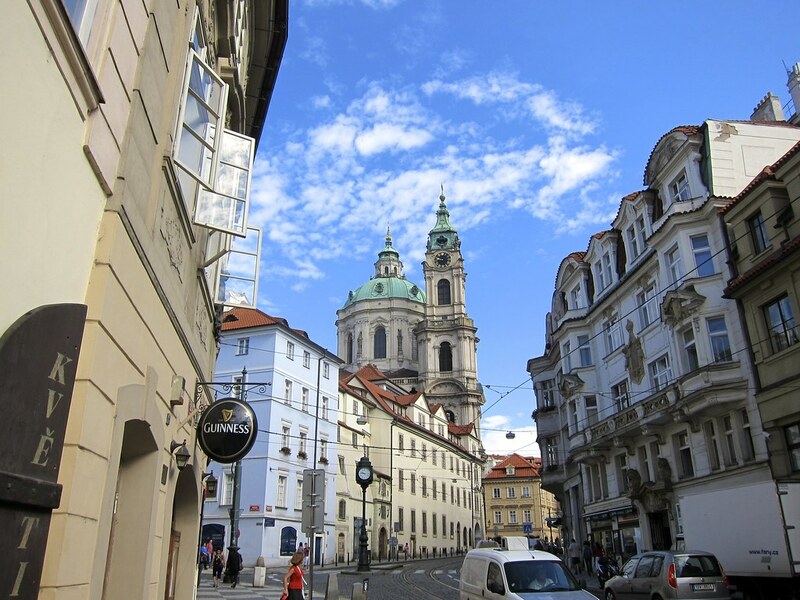 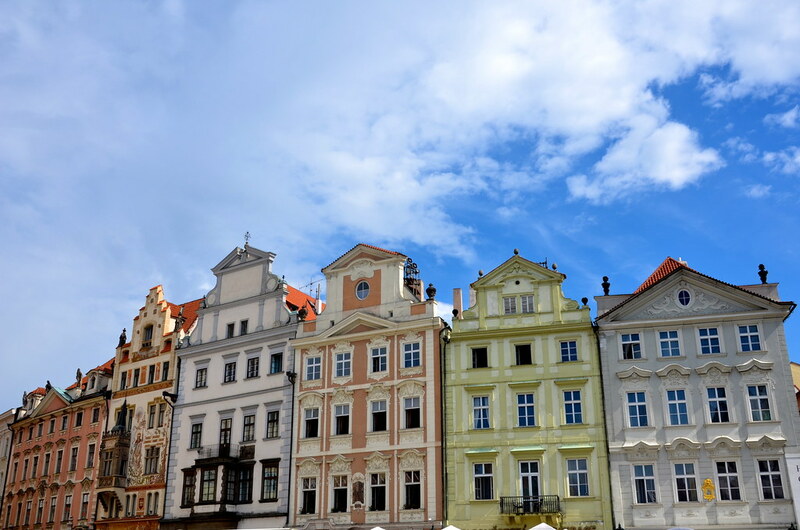 The fourth stop on our 2012 European Delivery adventure was Prague, the capital and largest city of the Czechia. 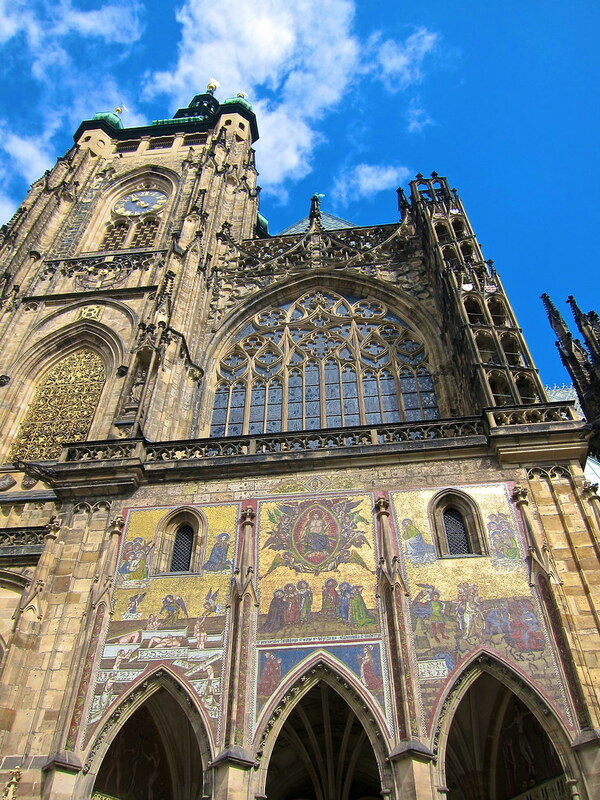 Prague is one of my favorite cities in the world! 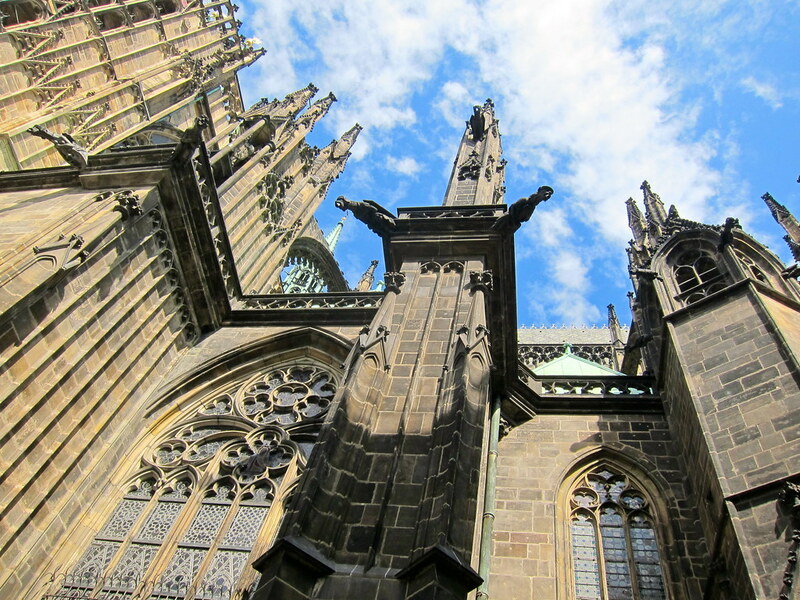 Our first time there was in 2005 for New Year’s Eve and ever since then, I couldn’t wait to get back. 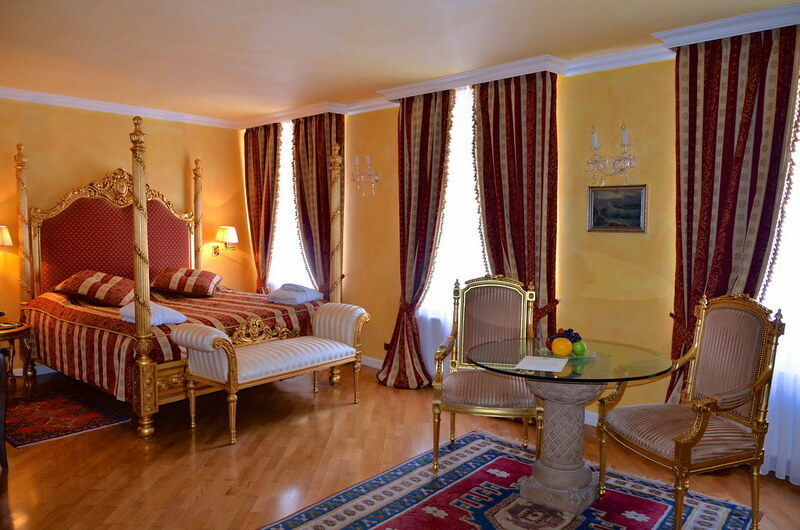 We found an incredible package on Luxury Link for the Alchymist Residence Nosticova. 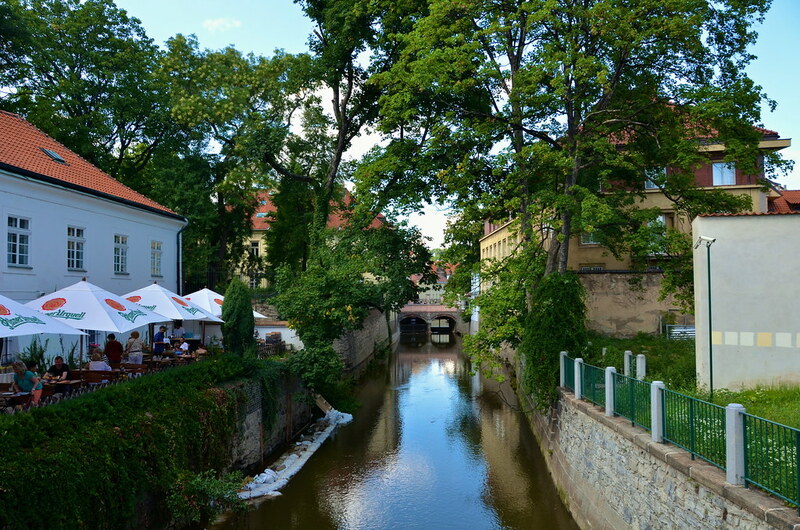 The package was for a Junior Suite, a bottle of local wine upon arrival, breakfast for two each morning, and a 3-course dinner for two at Alchymist Club Restaurant. 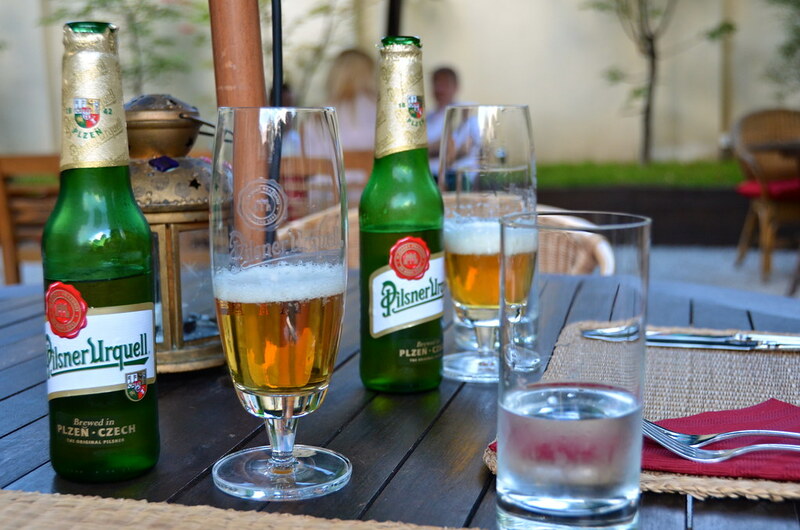 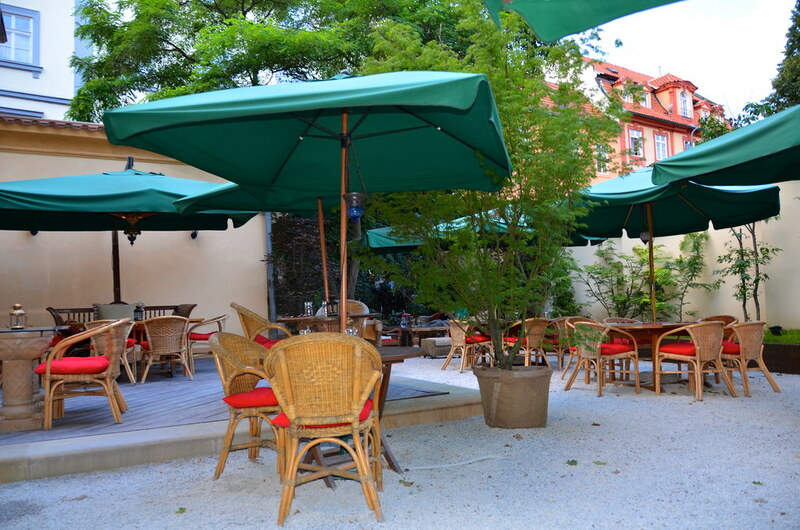 The restaurant has this outdoor courtyard area and is a perfect oasis for the warmer months in Prague. 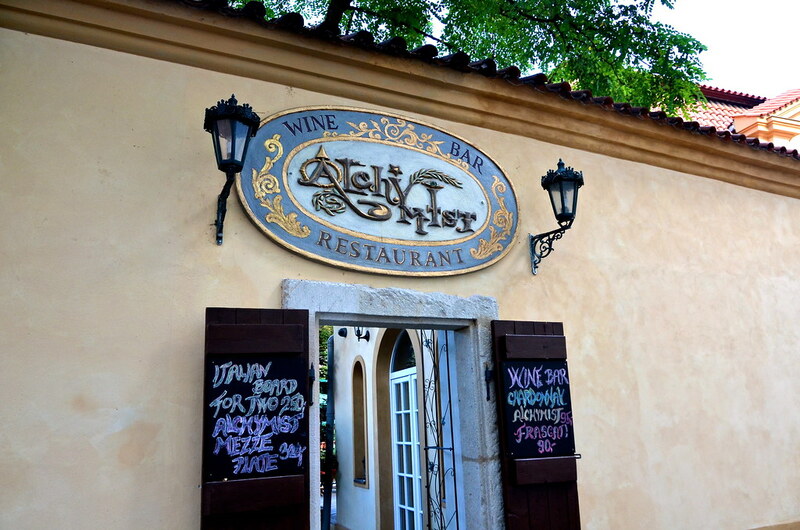 We ate there the night we arrived and every dinner except one during our stay. 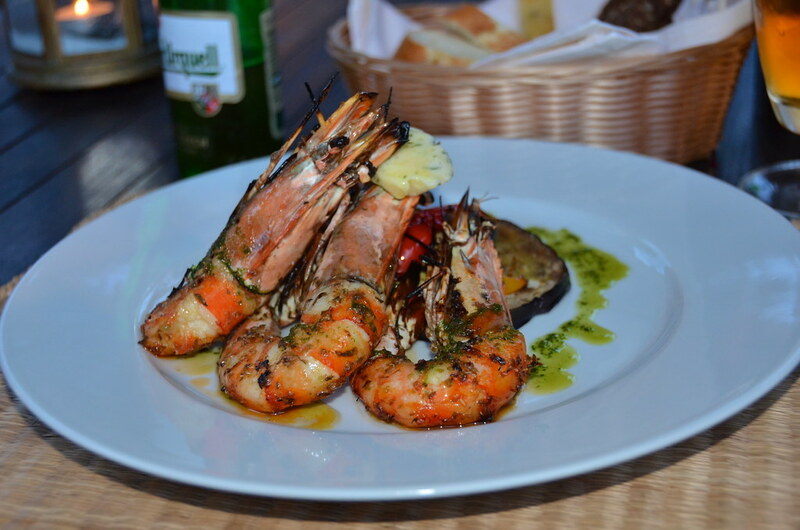 We loved it that much! 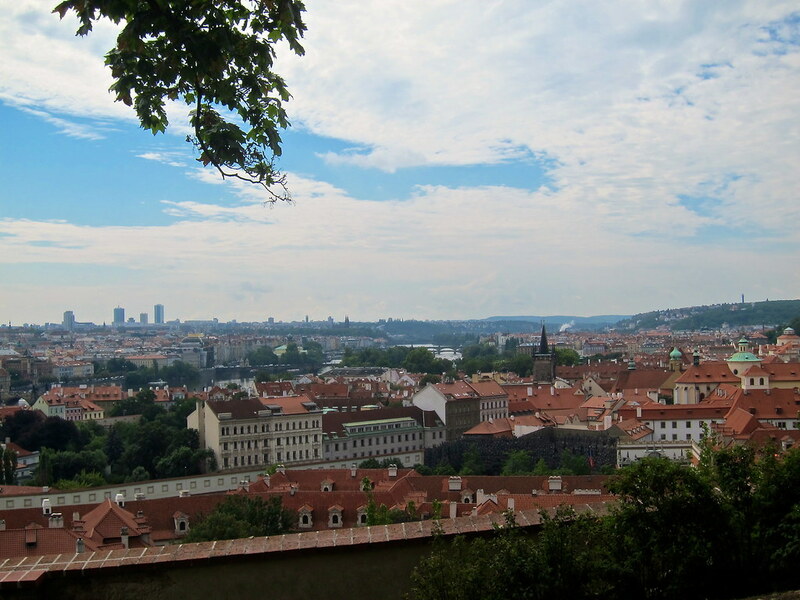 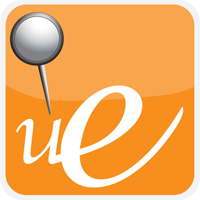 One day we went on a private tour with Eva Bartuskova of Sightseeing Prague. 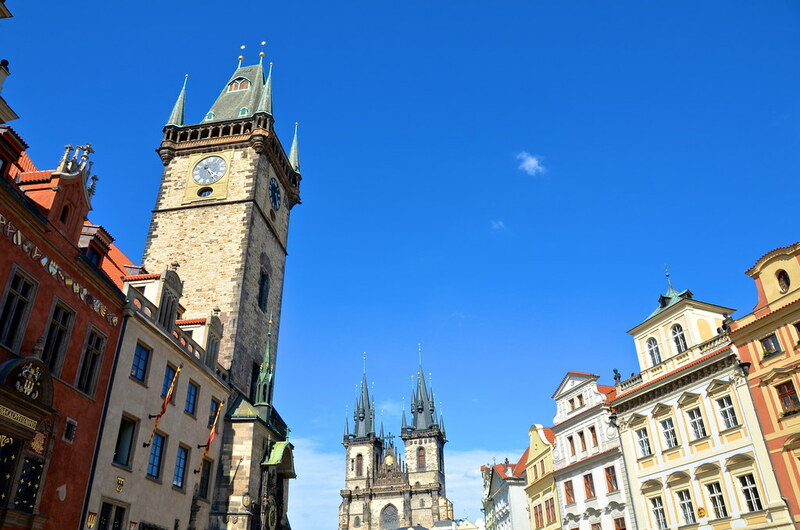 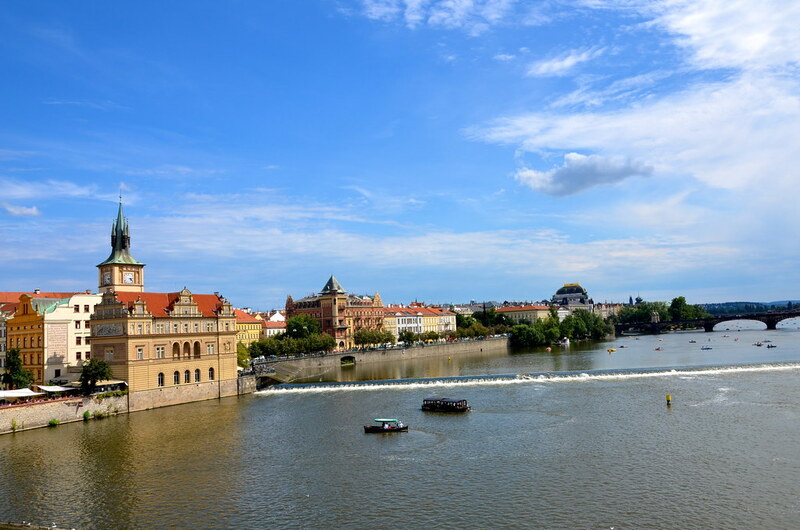 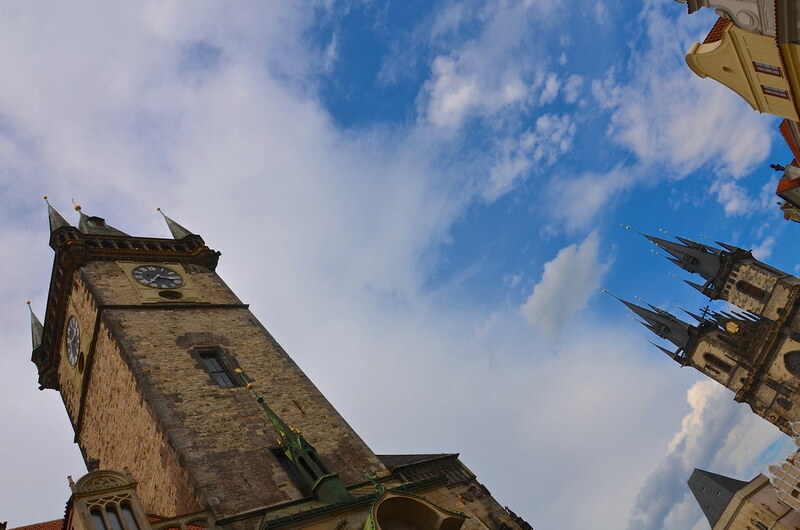 We chose to go on The Best of Prague Tour which covers the main sights of the historical center of Prague — Prague Castle, the Lesser Town, Charles Bridge, the Old Town and the former Jewish Town. 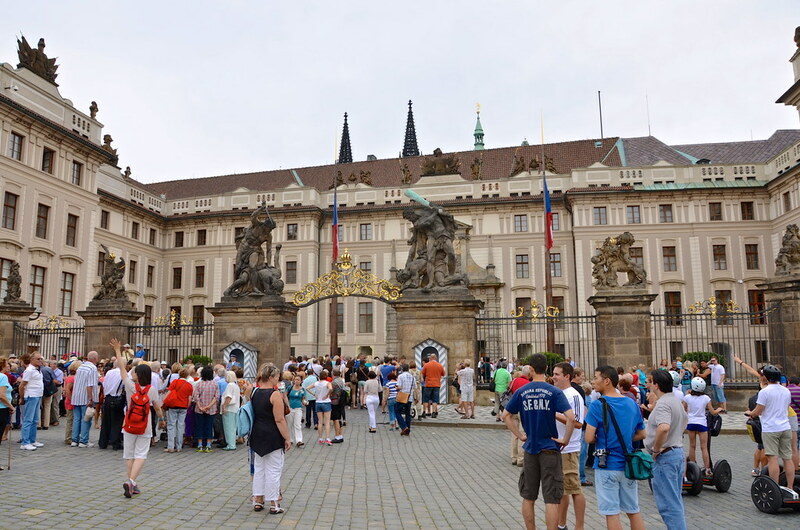 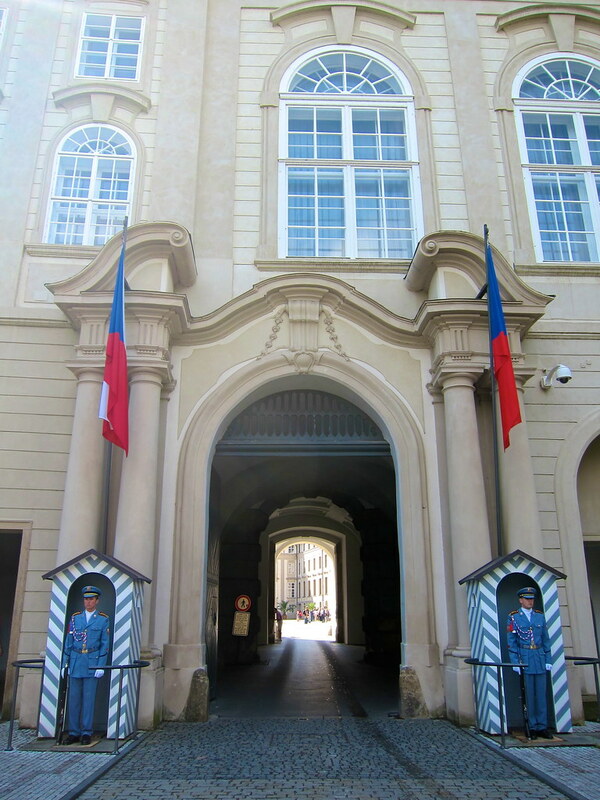 The Prague Castle complex is the largest castle complex in the world, with an area of almost 70,000 m². 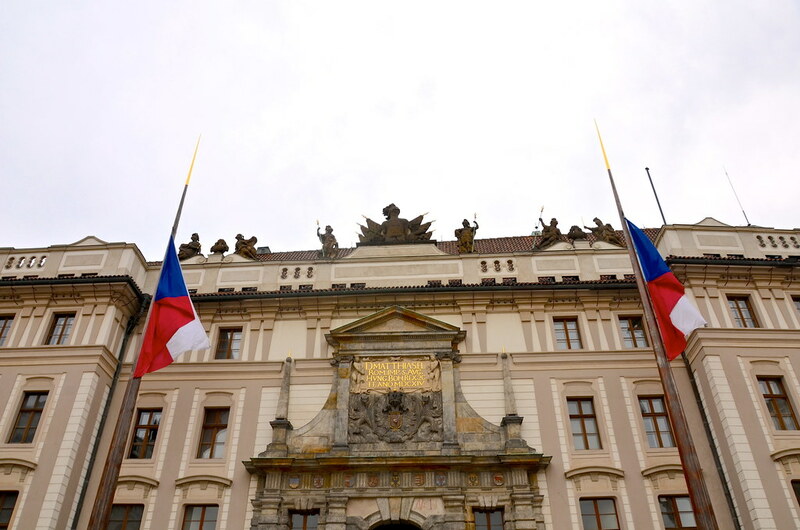 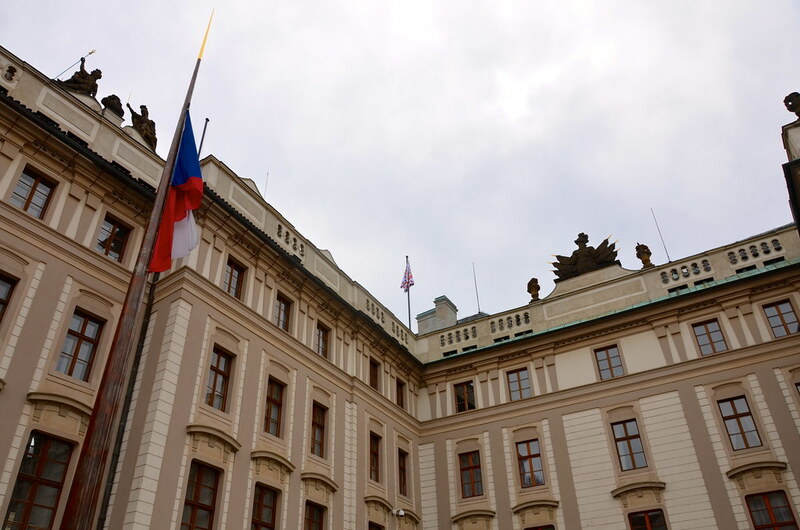 This flag indicates that president of Czechia is home. 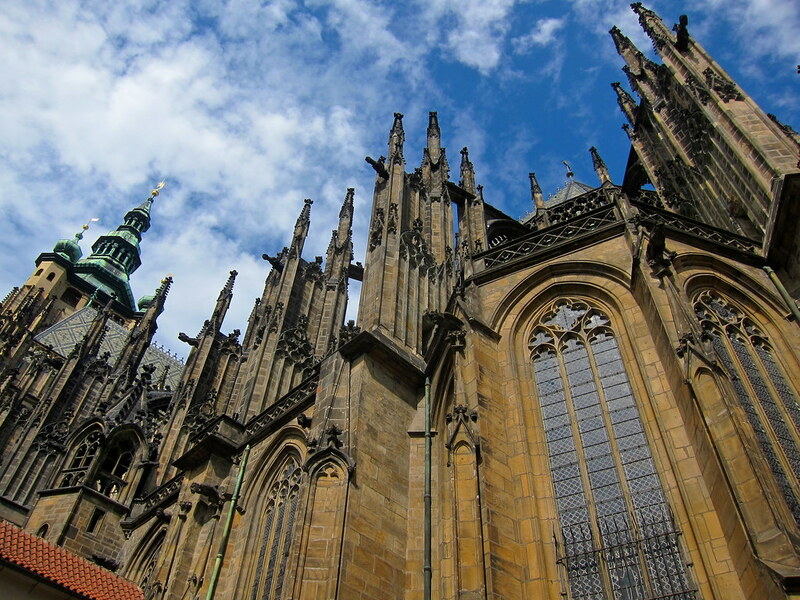 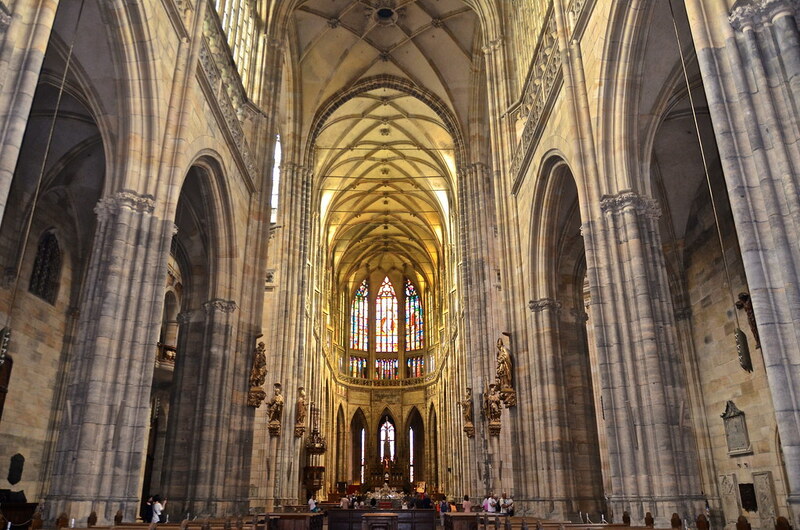 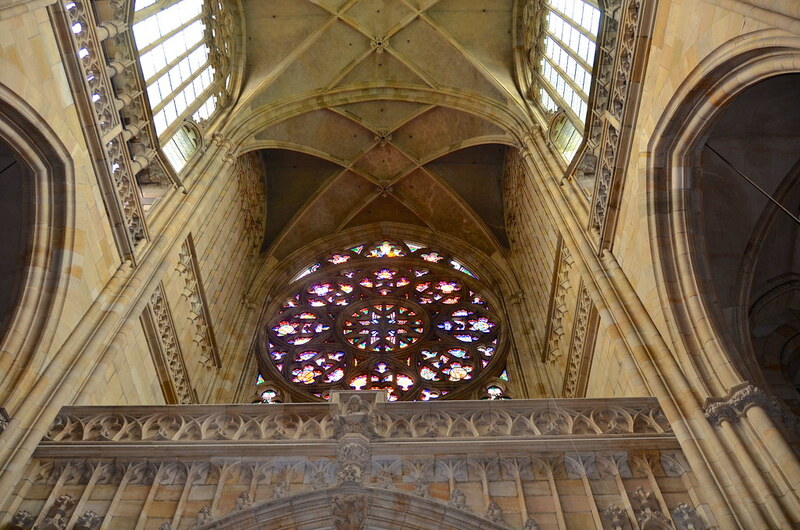 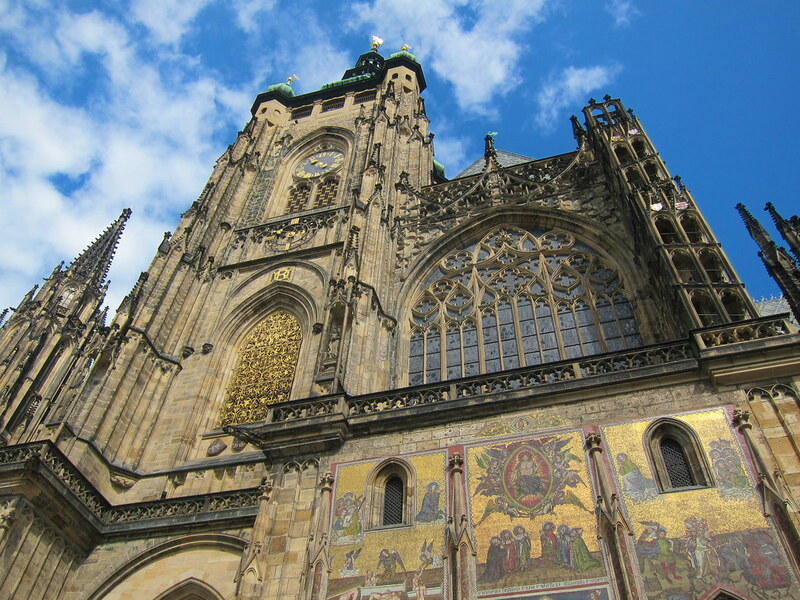 St. Vitus Cathedral is a Roman Catholic cathedral and is the largest temple in Prague. 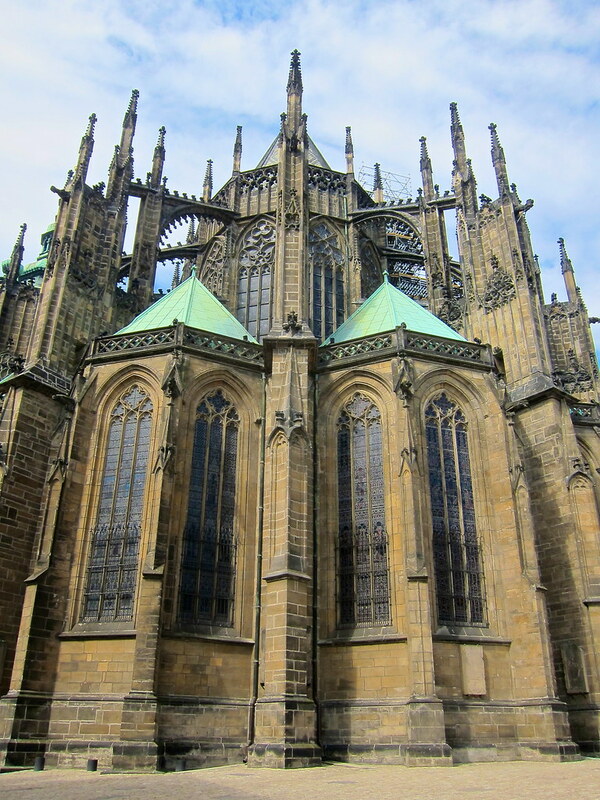 I fell in love with its Gothic architecture. 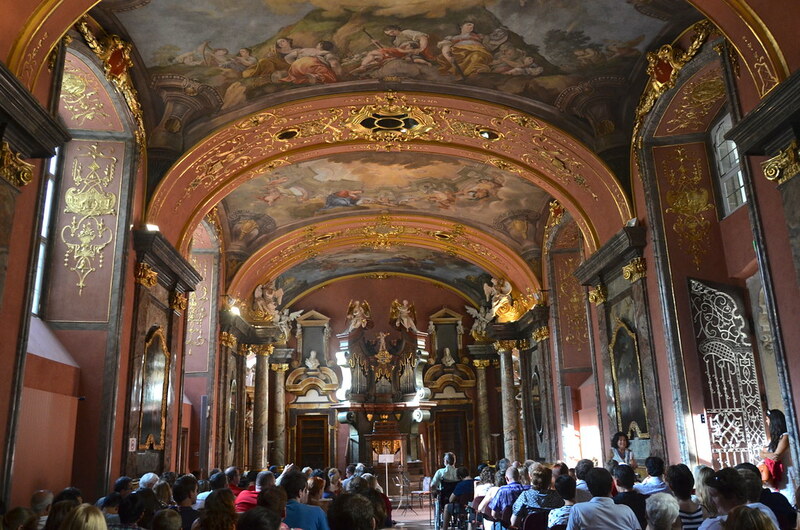 And the inside is impressive too! 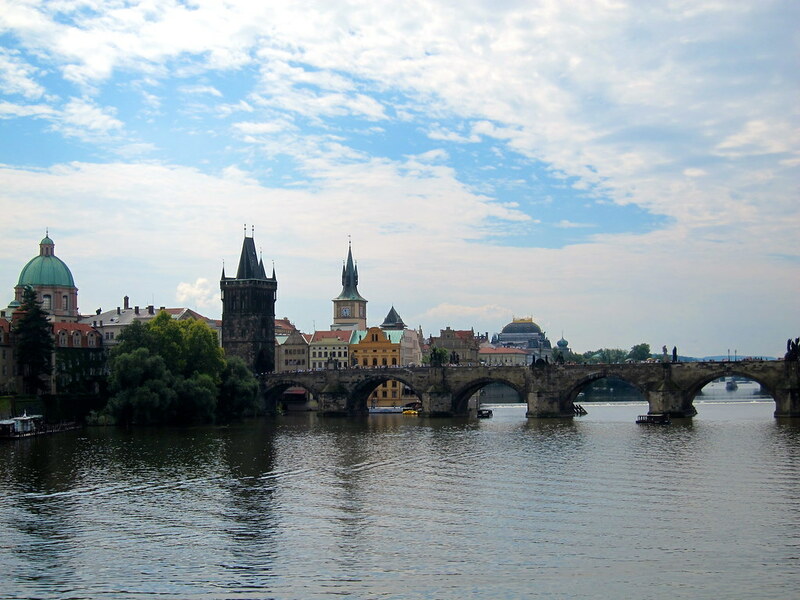 Charles Bridge is a famous pedestrian only bridge that crosses the Vltava river. 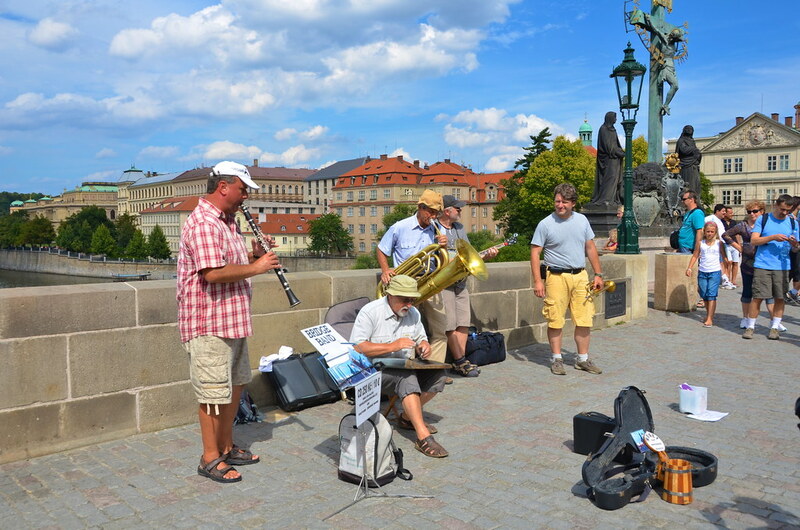 During the day, the bridge is filled with tourists, artists, and musicians. 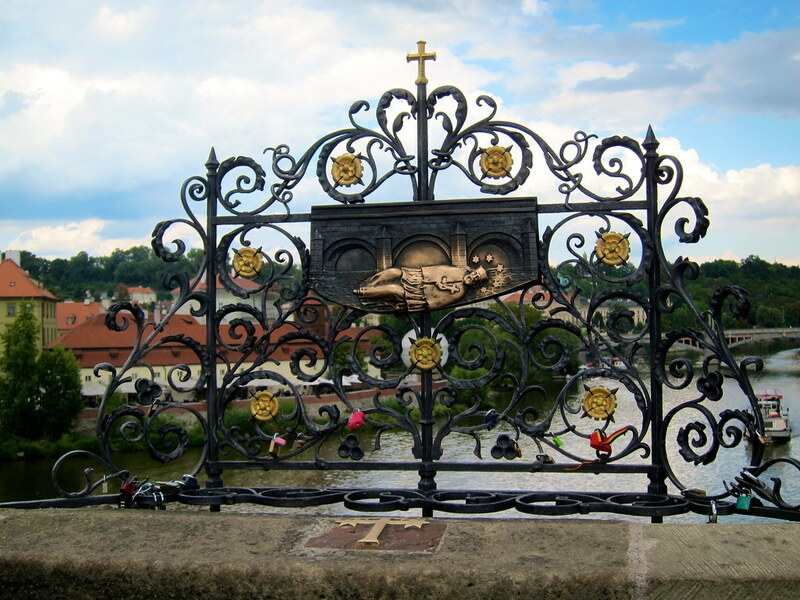 The Charles Bridge is where you can make a wish at one of St. John of Nepomuk’s bronze plaques. 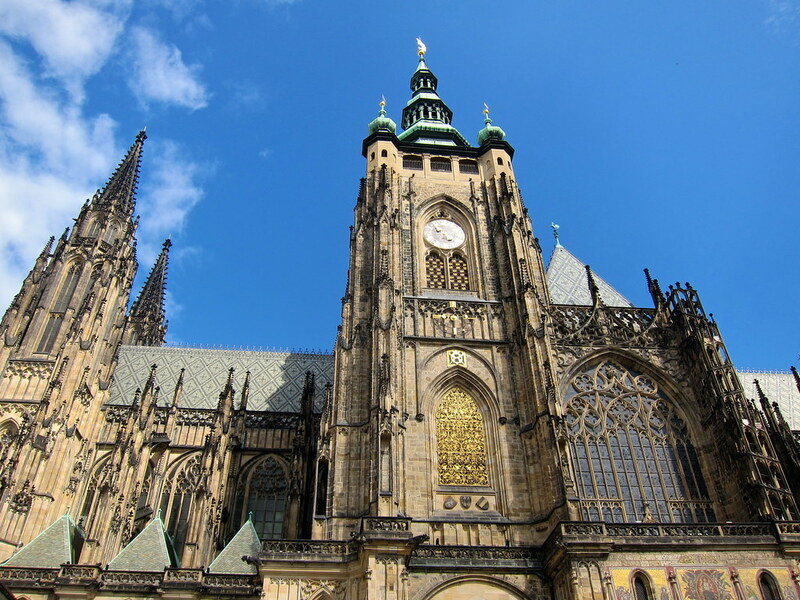 The legend states that John was confessor to the Queen of Bohemia, and that he refused to reveal to the King what she told him in confession. 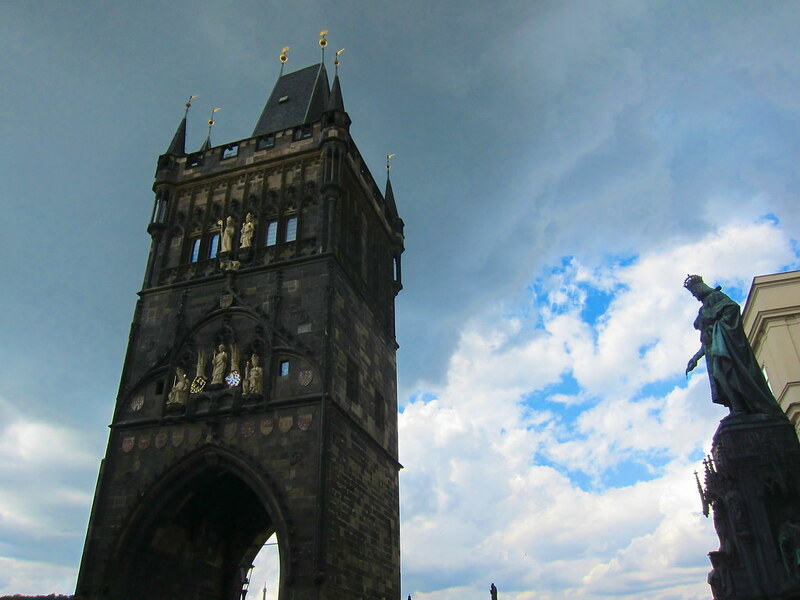 The King had John tortured and thrown from the Charles Bridge. 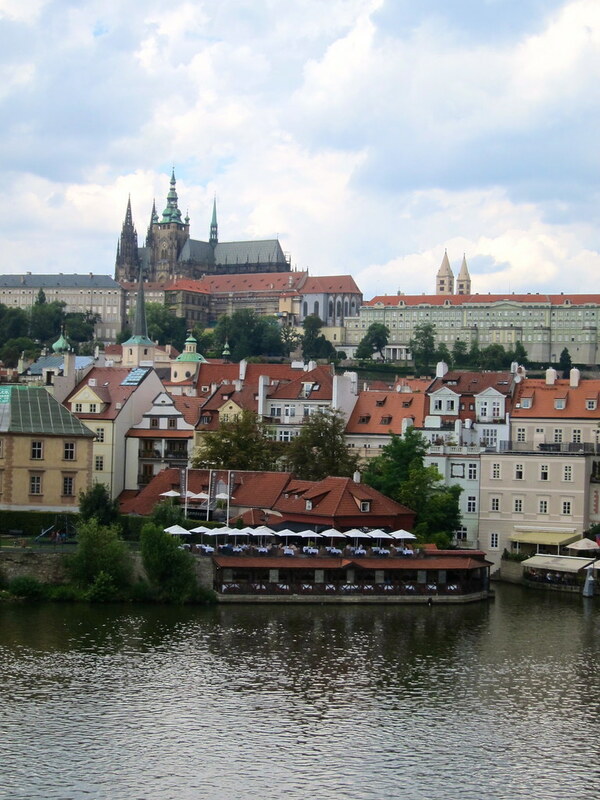 This is where he was thrown into the Vltava River. 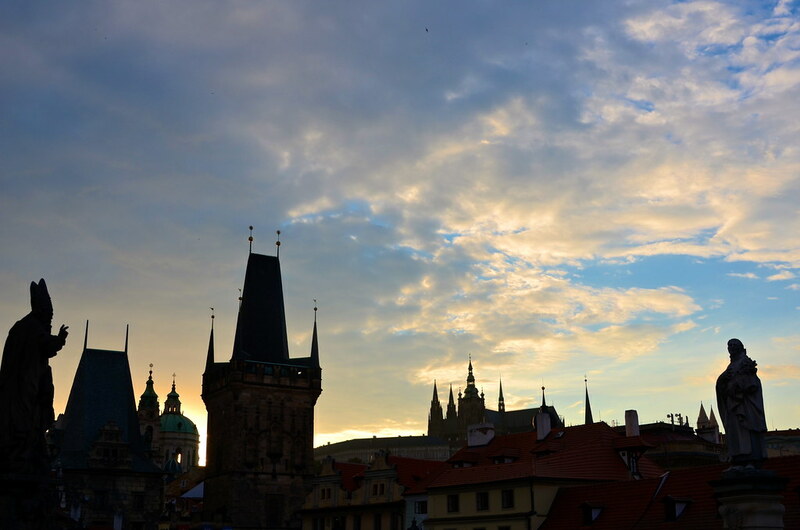 People believe that if you touch the plaques, your wish will come true and you will return to Prague. 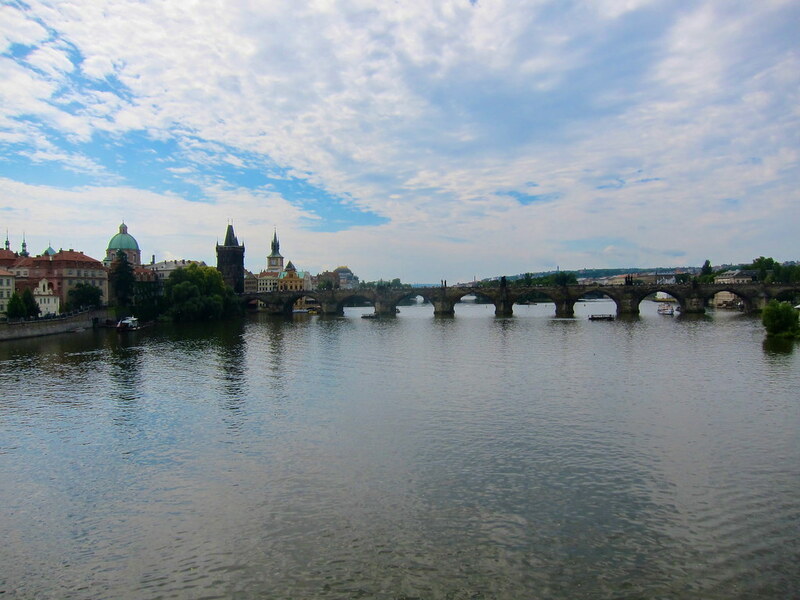 The Charles Bridge also offers a gorgeous view of the city. 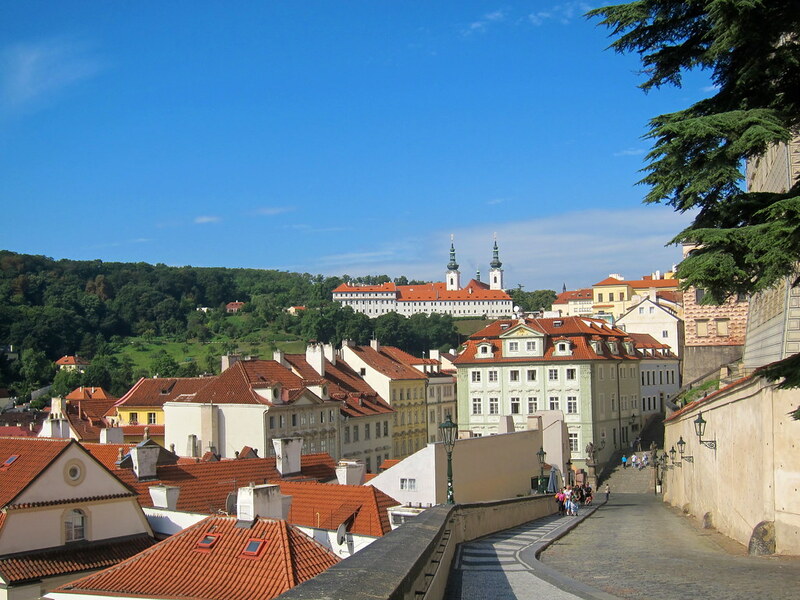 The bridge connects Old Town with the Lesser Town (Malá Strana) and Prague Castle. 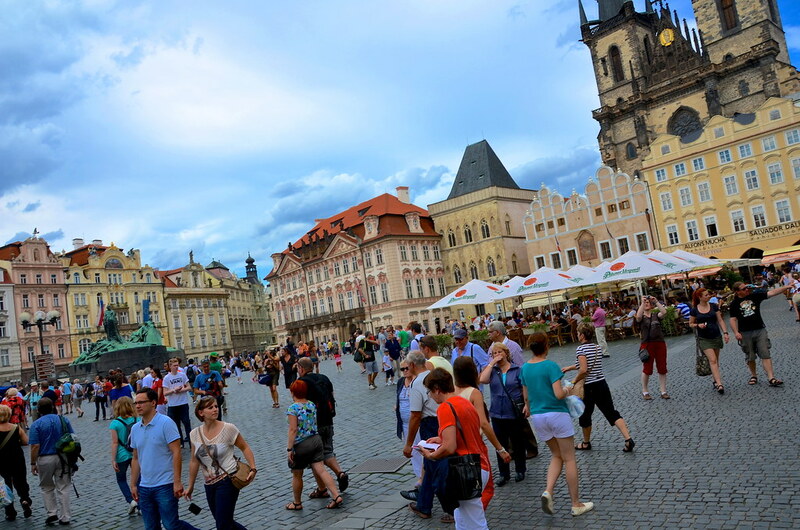 Old Town Square is probably the most popular area in Old Town. 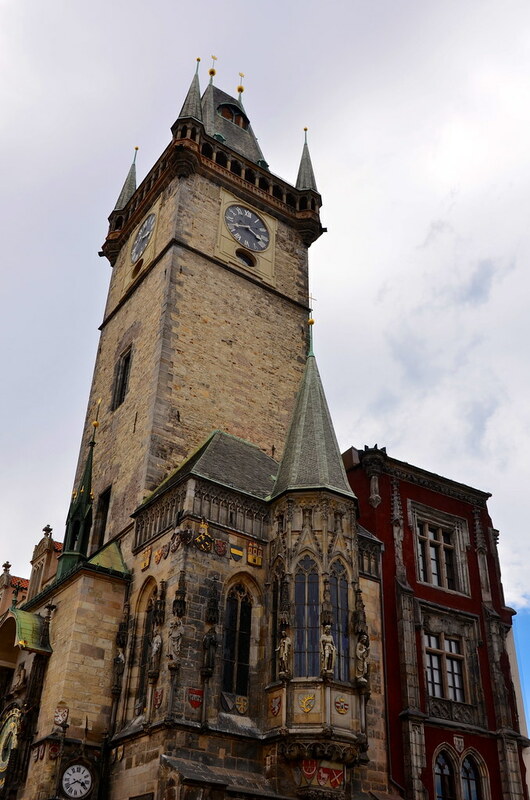 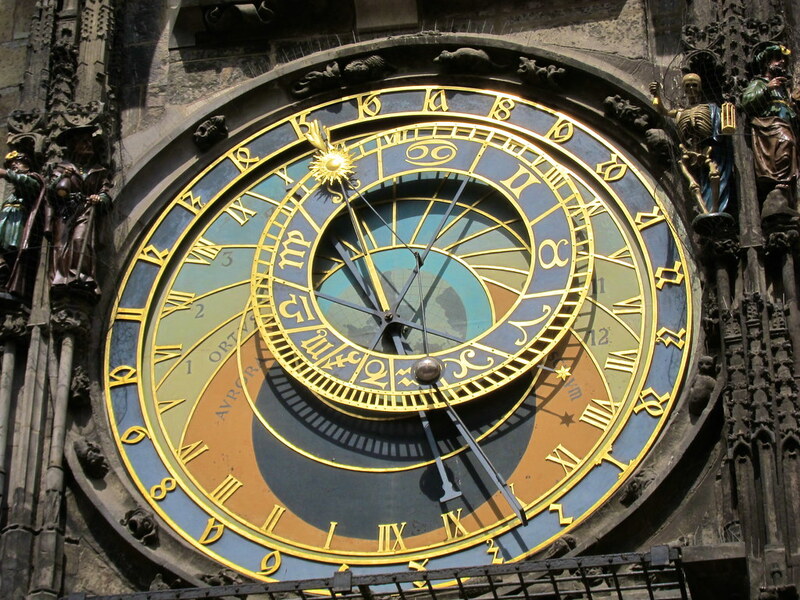 This is where you’ll find the Týn Church, St. Nicholas Church, and the Astronomical Clock. 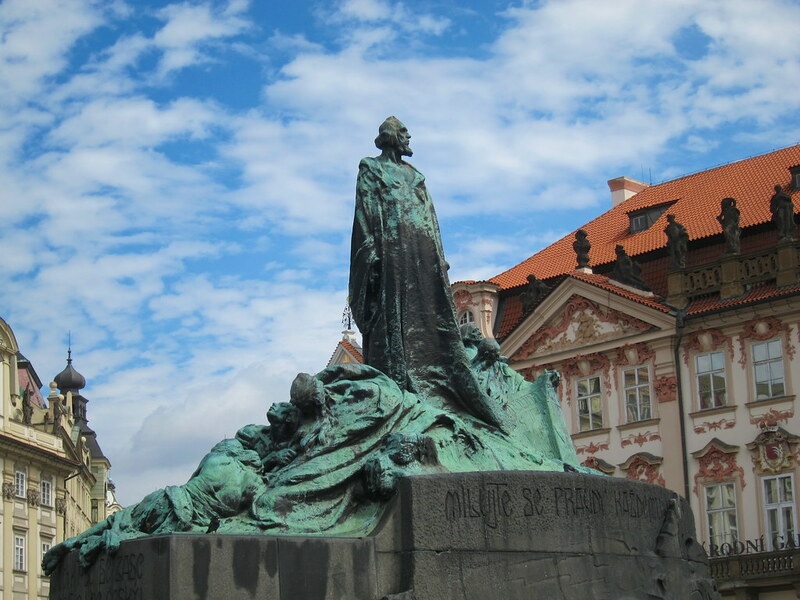 And at the center of the square is a statue of Jan Hus — a religious reformer, Czech priest, and philosopher. 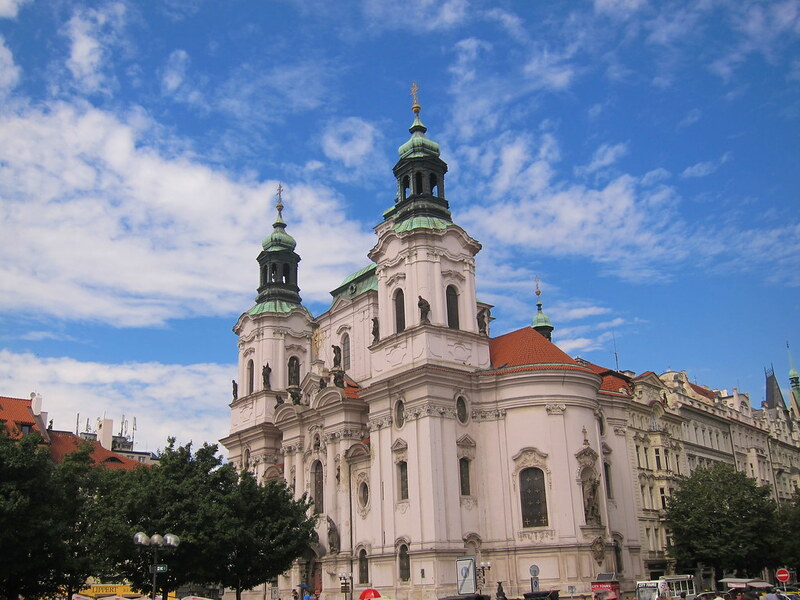 He is best known for having been burned at the stake for heresy against the doctrines of the Catholic Church. 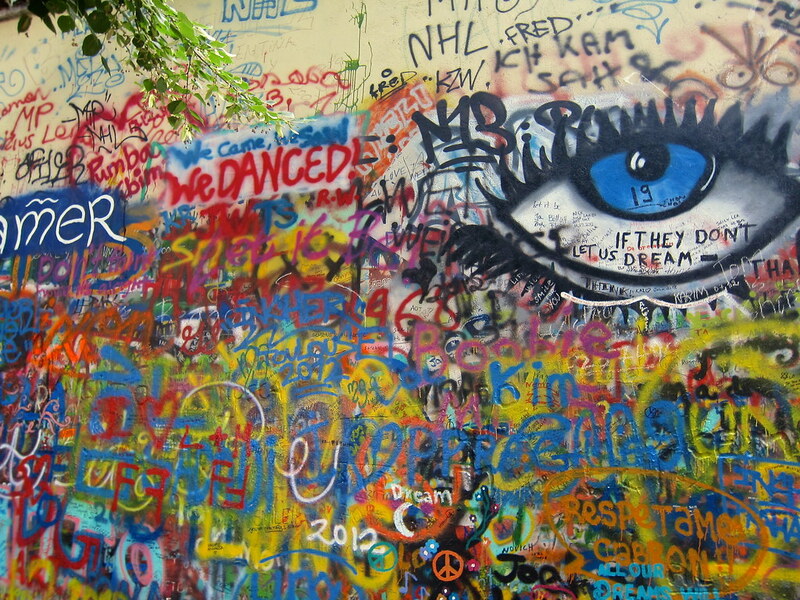 Near the Charles Bridge (in Mala Strana) is the John Lennon Wall. 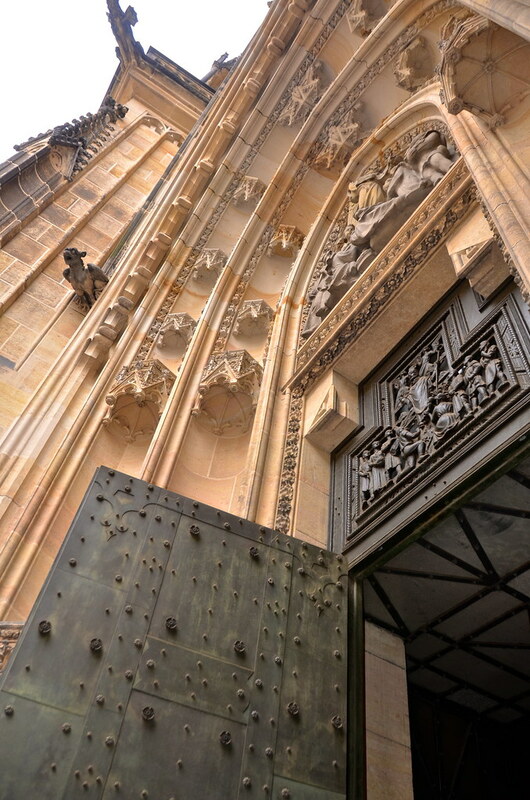 The wall is a memorial to Lennon and his ideas for peace. 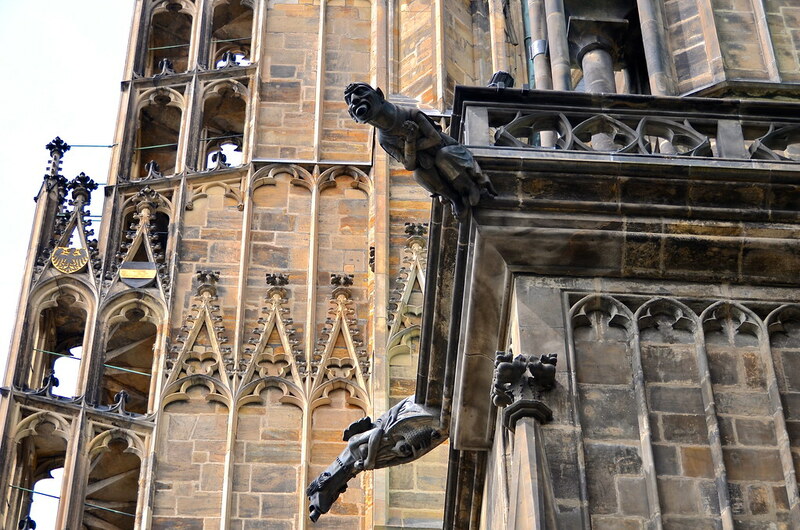 It’s also a monument to free speech and the non-violent rebellion of Czech youth against the Communist regime. 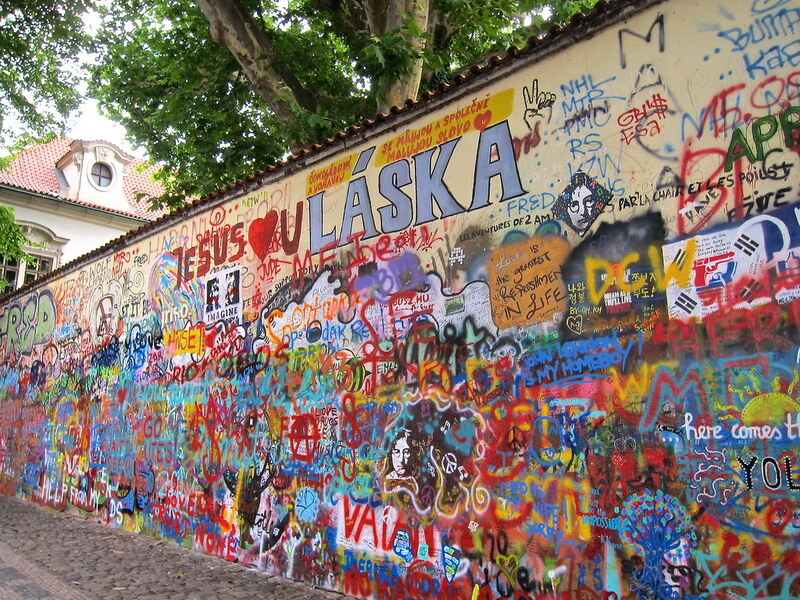 The wall used to be covered in anti-Communist graffiti but now it’s covered in messages of love and peace. 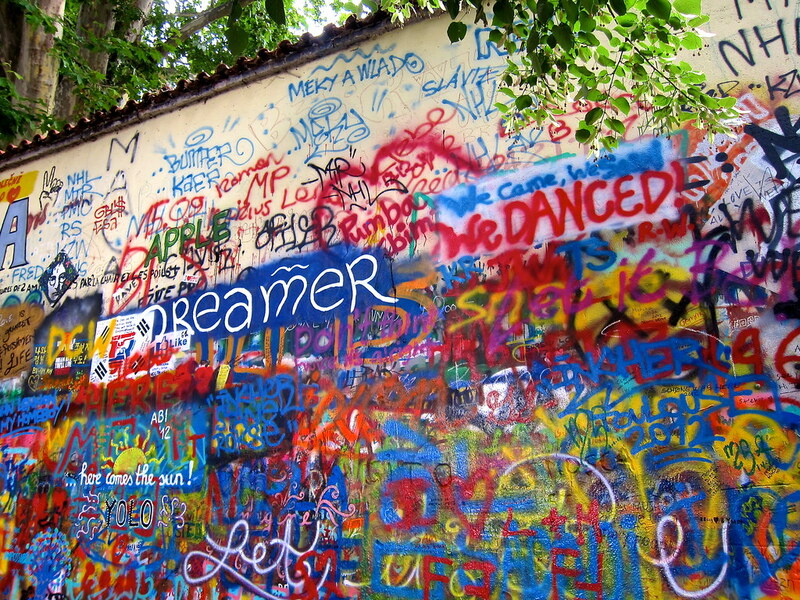 The wall is alive in a sense… the art and message changes everyday. 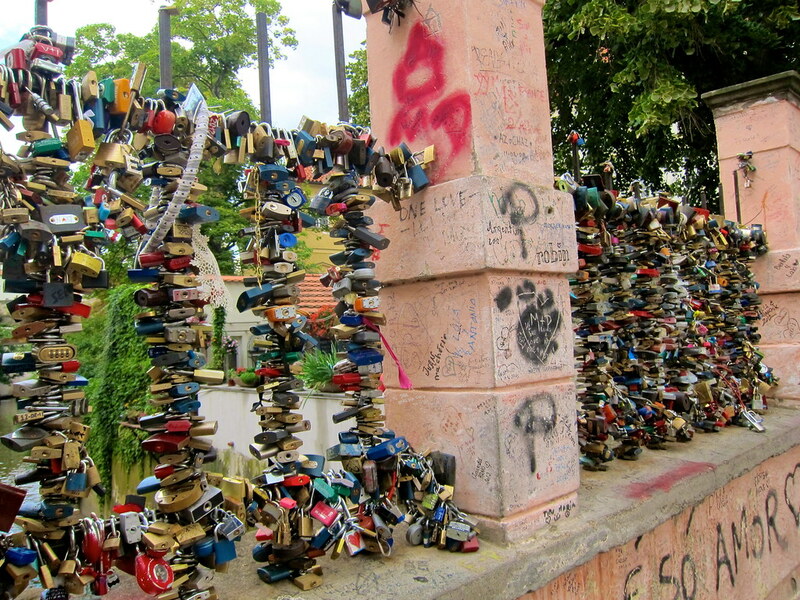 In cities all over the world you’ll see Love Locks. 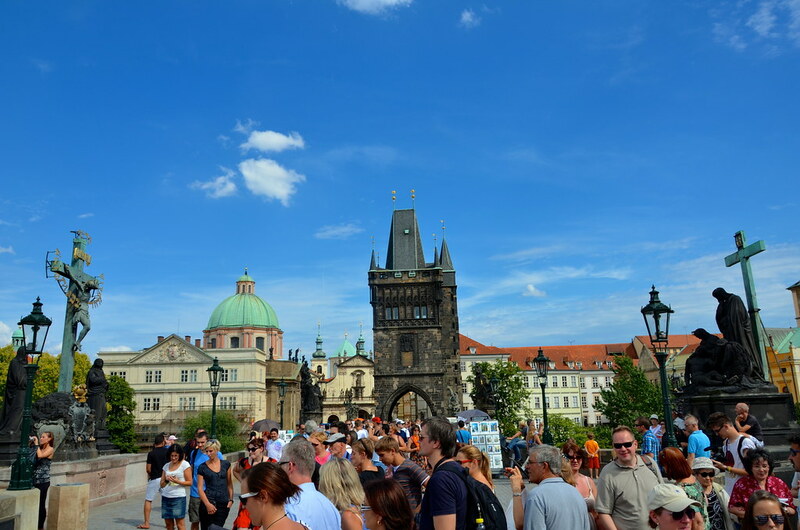 You can find Prague’s Love Locks on a gate near the Lennon Wall. 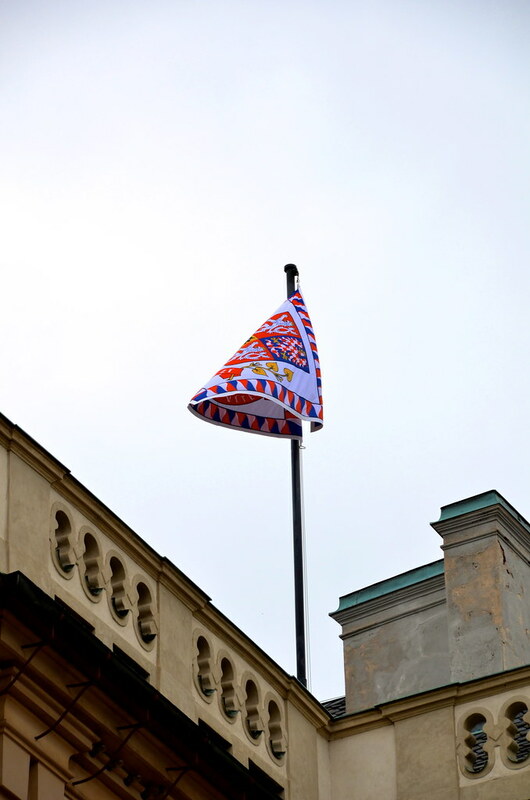 It’s a symbol of a couple’s everlasting love to each other. 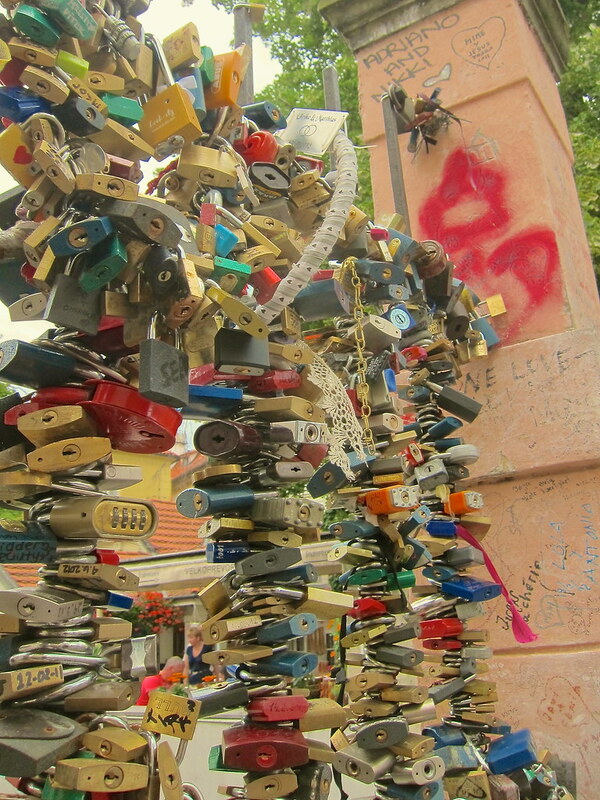 Many lovers write their names on the lock, lock it, and then toss the key into the canal below the gate. 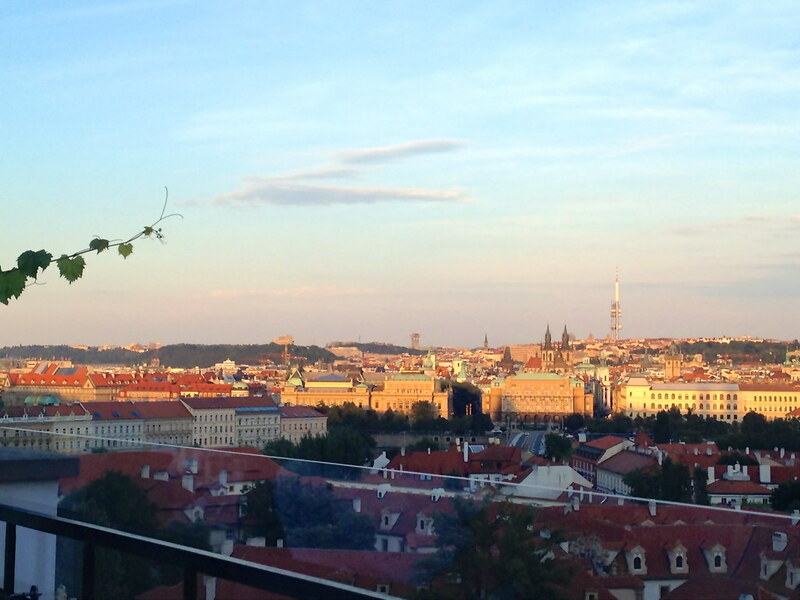 On our last night in Prague we went to Restaurant Terasa u Zlaté Studně. 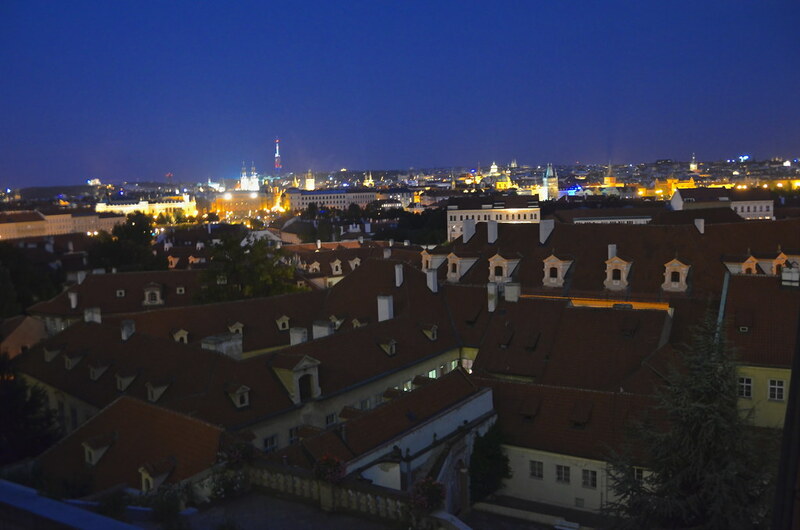 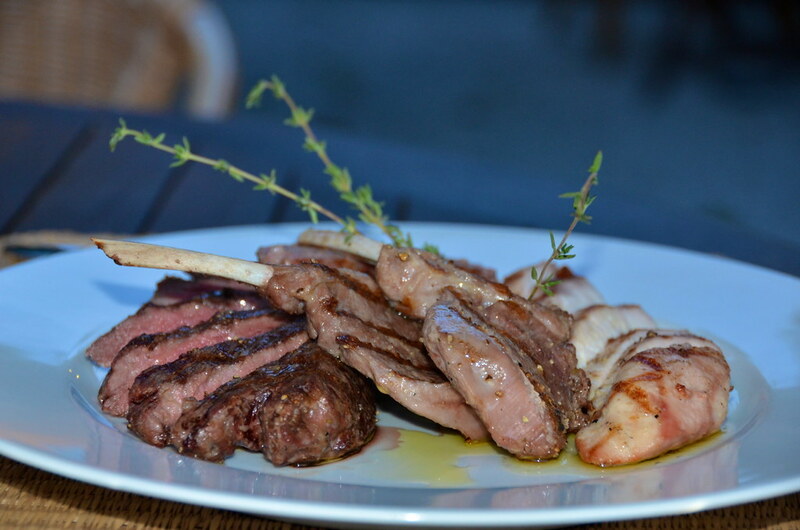 The restaurant is located on the fourth floor of the U Zlaté Studně Hotel. 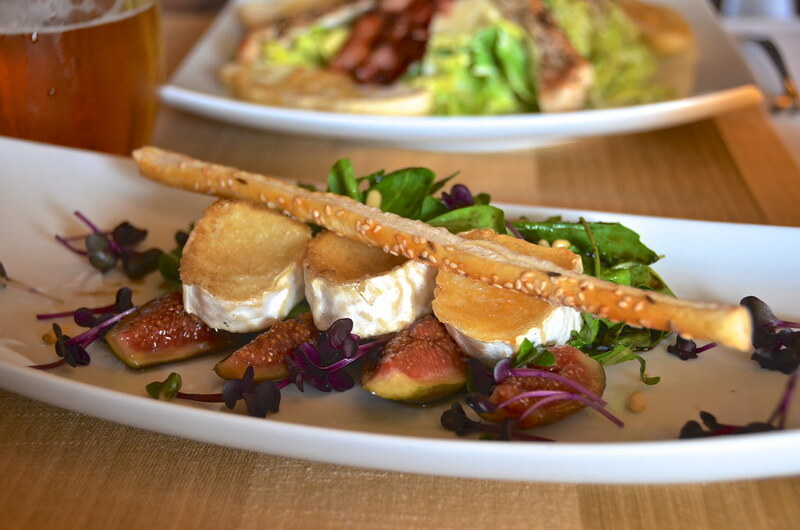 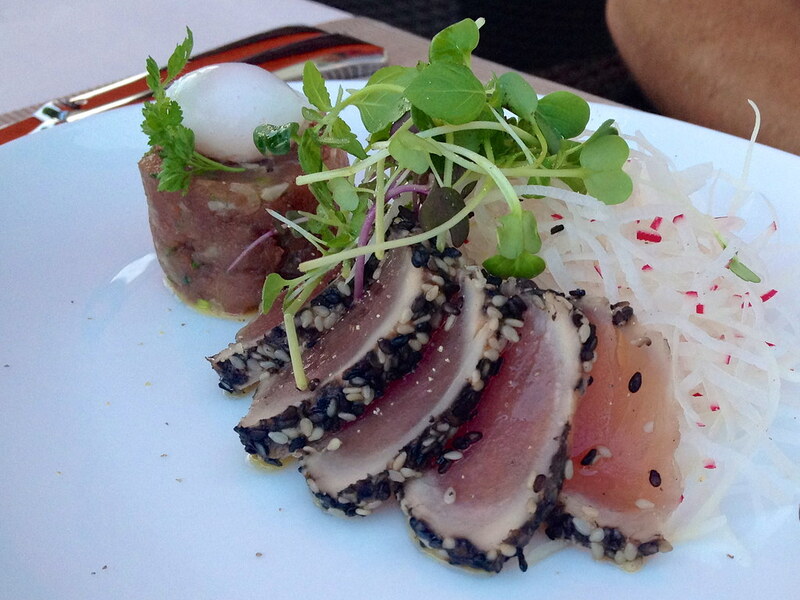 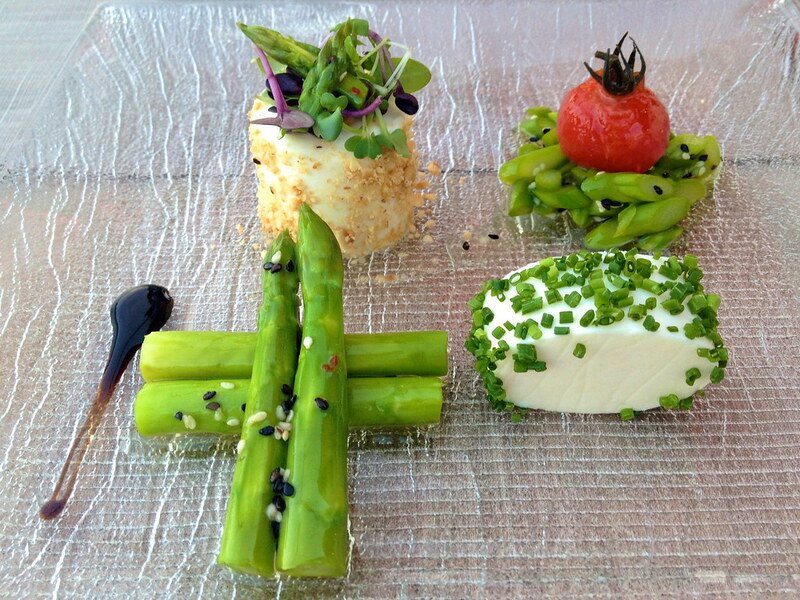 The food was creative and delicious. 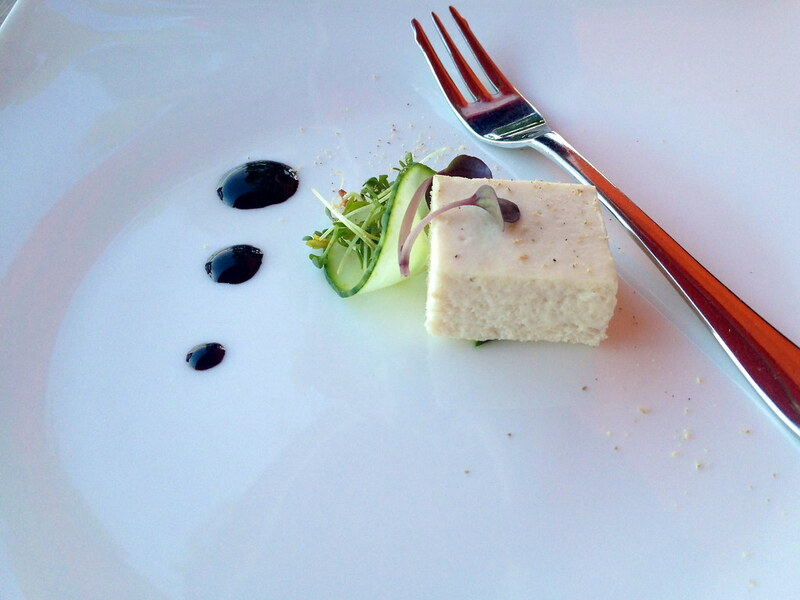 But the view was the highlight of the meal. 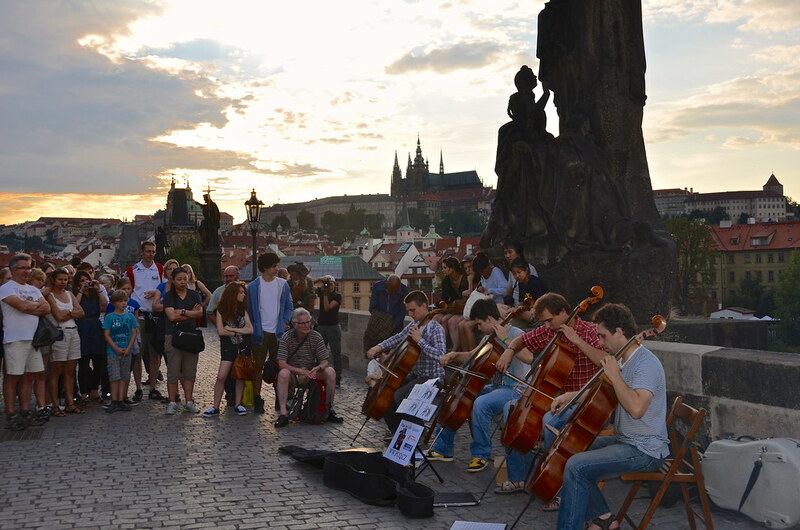 The vibe in Prague is hard to explain. 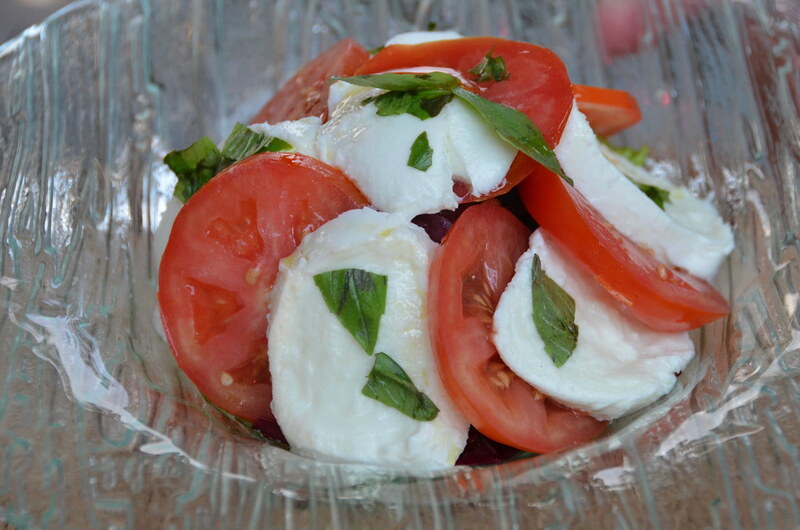 There is just something about it that keeps you wanting more. 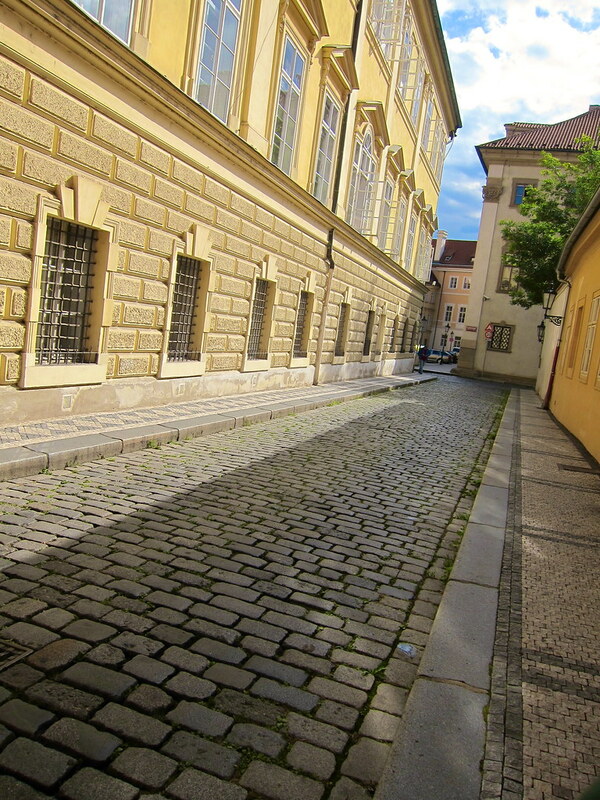 You can read about the BMW European Delivery process HERE and HERE. 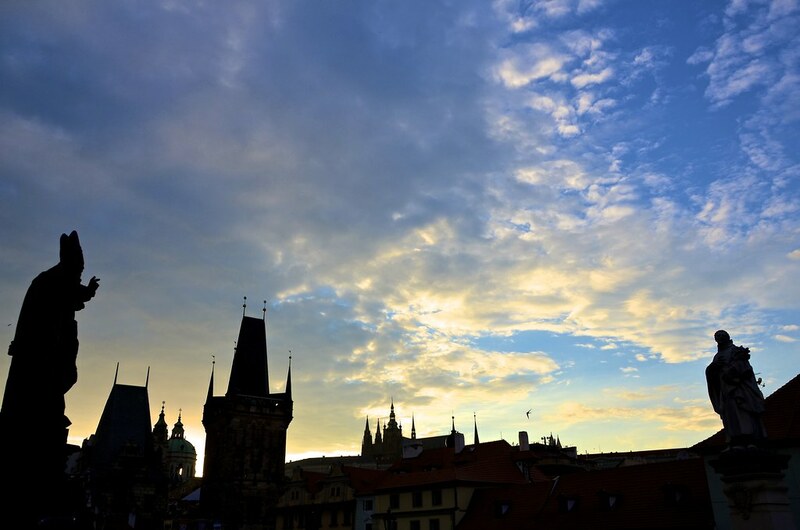 3 Responses to "Prague, Czechia"